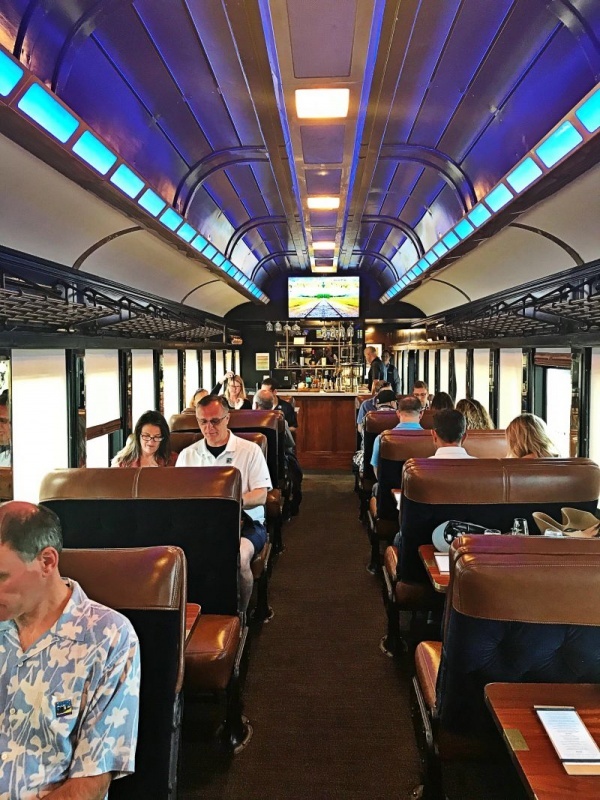 You may remember that we reviewed the Napa Valley Wine Train about eighteen months ago. I came away from that experience truly loving it. 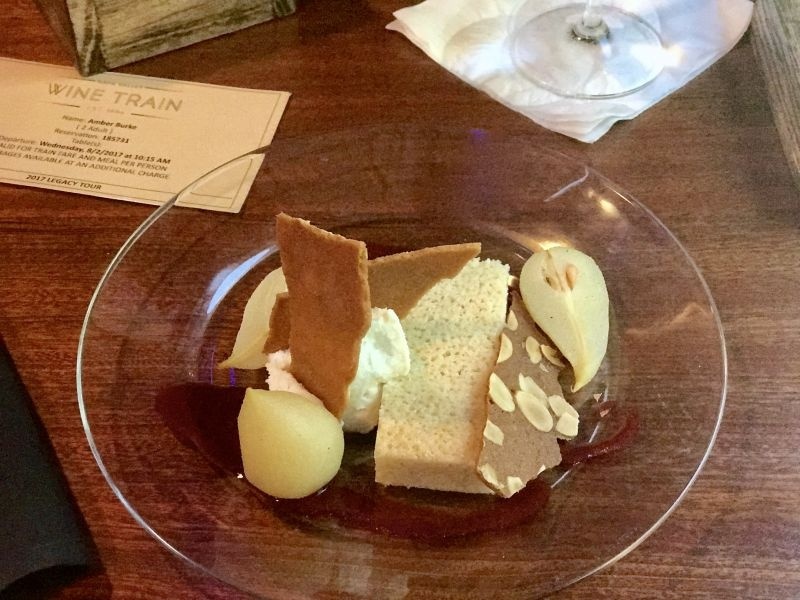 The train, the food, the service, and the experience all got top marks from me. But did you know that they do more than just the classic dining train ride? 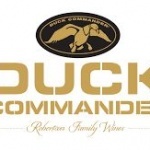 They have several types of excursions: Rocking the rails, Murder Mystery, Meet the Winemaker Dinners, Twilight Private dining tours, and three different Quattro Vino tours. I had no idea! I had the opportunity last week to take the Legacy Tour. 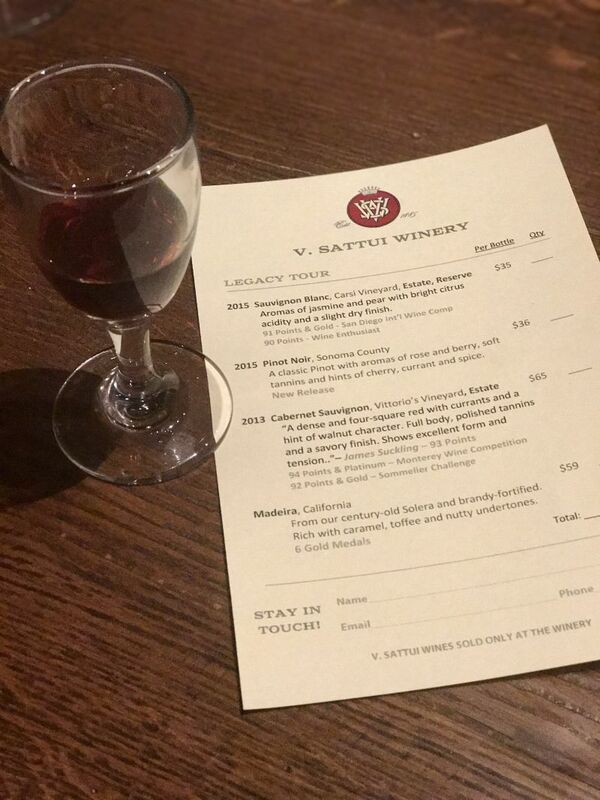 We visited the wineries of Robert Mondavi, Charles Krug, and V. Satti. 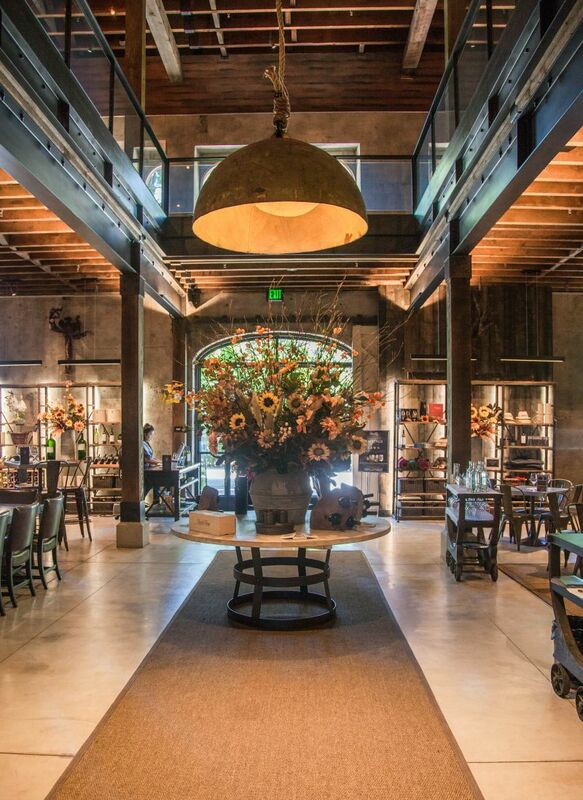 Between each winery, we were served a wonderful course of food as we rode through the gorgeous scenery of Napa. Our train style seemed like it was from the art deco period; clean lines and a cool lighted ceiling. The wood tables, linen napkins, and blue velvet upholstered cushions gave us the feeling of dining in style. We were even greeted with a glass of sparkling wine to start. 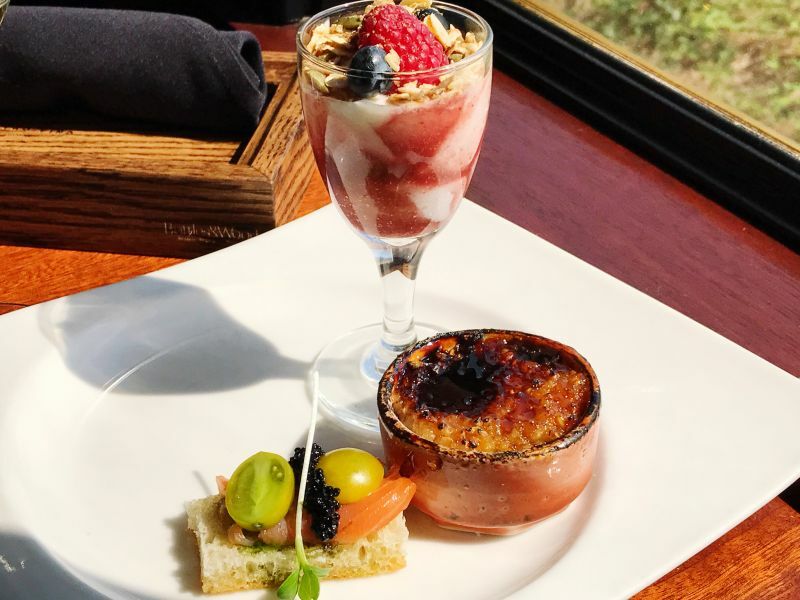 Our first course on the train was a small bowl of spiced steel cut oats with a brulée crust, a yogurt with berry parfait & granola topping, and finally a smoked salmon crostini with tomatoes & a dollop of caviar. 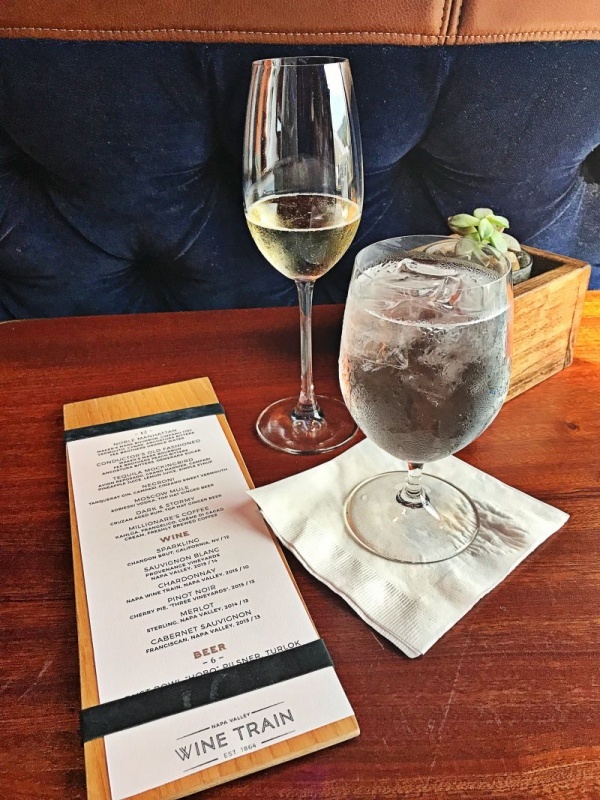 I have to say each item was delicious and fresh tasting; I really enjoyed the combination of flavors with my sparkling wine. It was beautifully served and presented by the staff. We were off to a wonderful start to our journey. 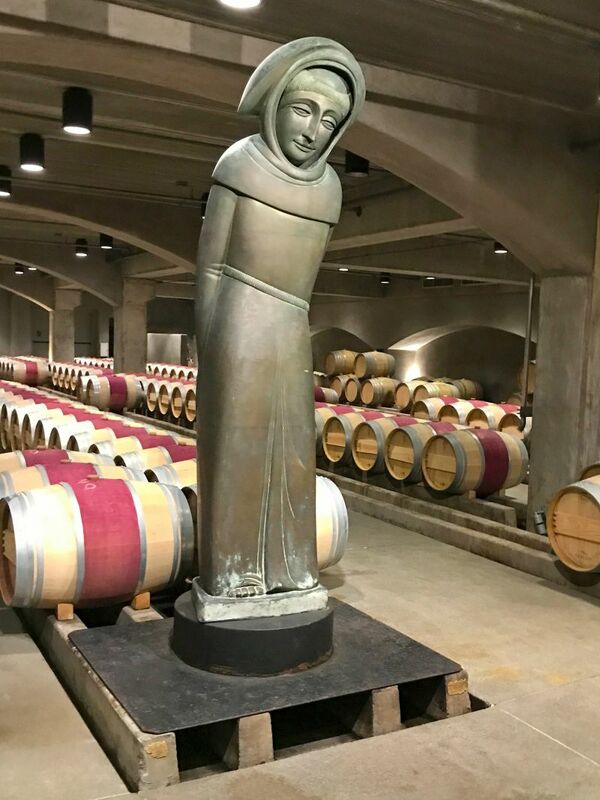 Our first stop was Robert Mondavi Winery. We were given a tour of the grounds and a little history by one of their ambassadors. We then made our way down to their caves where we tasted a few of their current release wines. I hadn’t been to the property before so it was interesting to hear a little about the history and see the gorgeous art that is scattered around the buildings. Back on the beautiful wine train, our next course was served to us. 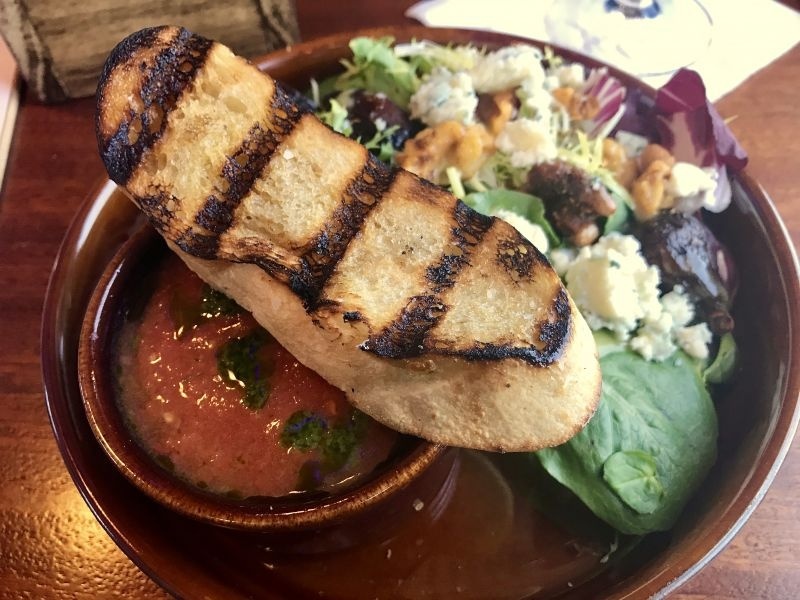 A cool gazpacho soup topped with an herb pesto and served with a grilled garlic bread slice along with a spring mix salad with goat’s cheese, whole figs, and walnuts. The acidity of the gazpacho was a wonderful complement to the goat’s cheese and the earthy salad greens; the fig added a little sweetness. The dressing was a light olive oil and salt mixture that gave life to the dish without overwhelming the flavors. We really enjoyed this course. Our next stop was at the beautiful Charles Krug Winery. 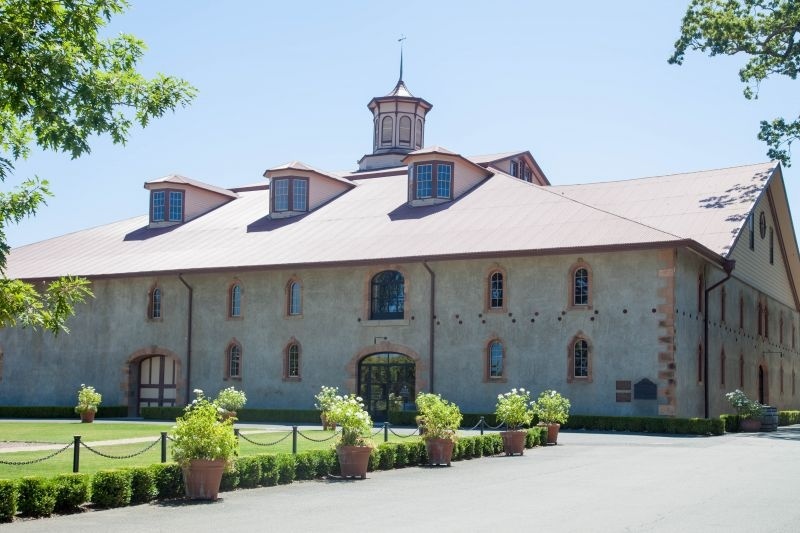 Steeped in history, this winery has it all; beauty, great wines, and a wonderful atmosphere. You can read a full article about them here. 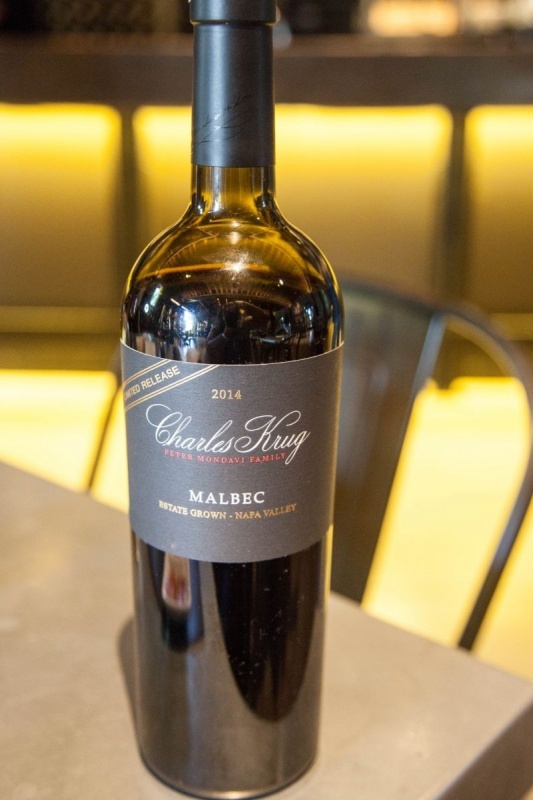 We had the opportunity to hear about their long and distinguished history as we sipped their Reserve Sauvignon Blanc, toured their barrel room, and even tasted Malbec from the cask. (It is an awesome sip, even so young). Upstairs in the private events room, we had an opportunity to taste some of their wonderful Cabernet Sauvignon. I especially enjoyed their Generations Cab. Before we knew it, it was time to get back on the train and head for our next stop. Our main course entree was served to us at this point. There were only two choices, so we decided we would share so we could tell you about the offerings. There was an oriental style salmon and a pork belly to choose from. I have to say that I was a bit disappointed in the salmon, just as I was the last time I visited the wine train. There were a couple of things I didn’t care for about the dish. 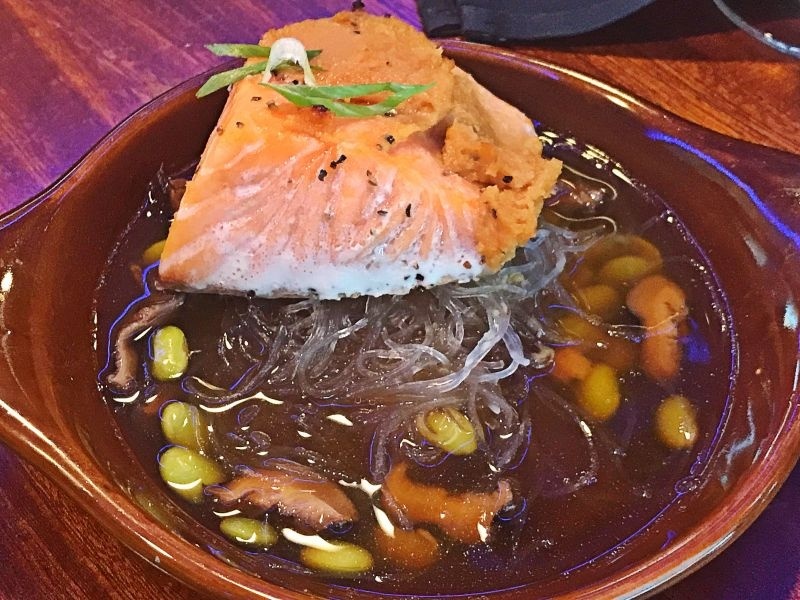 It was served in a thin broth with a few edamame and some glass noodles. There was a miso paste on top of the salmon which made it way too salty. The broth was just meh and the glass noodles didn’t do much for the flavor. It managed to be over salted and bland at the same time. The salmon itself was cooked beautifully, which was a shame considering the rest of the dish didn’t work well. 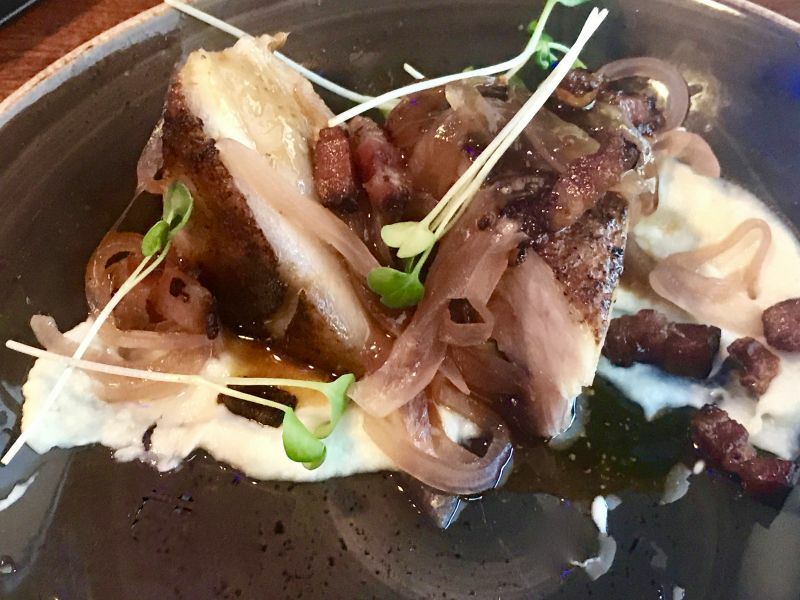 On the other hand, the pork belly was outstanding; served on a bed of pureed cauliflower it had a very rich glaze which amplified all of the flavors. The crispy bacon bits and pickled onion gave it an additional dimension and interest; the little bits of cress gave it some earthy texture. My companion and I both loved this plate. Delicious! 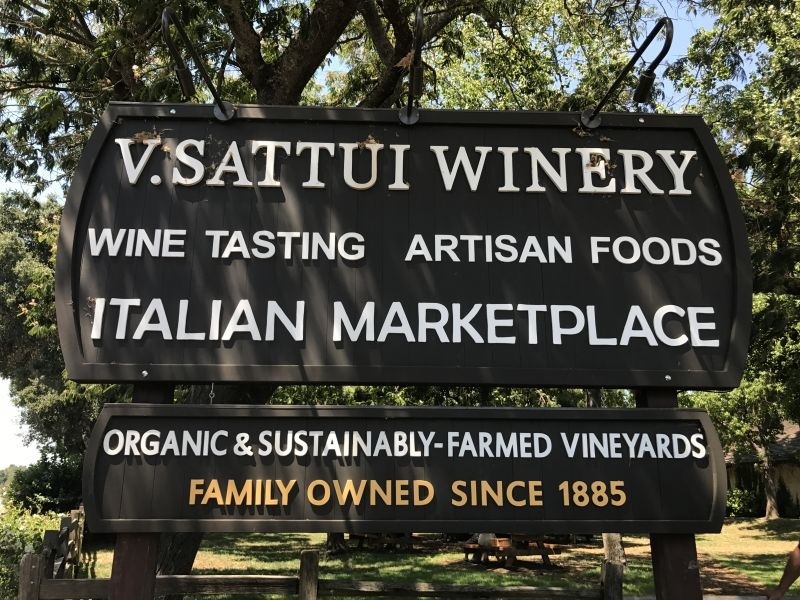 Our final stop was the very famous V. Sattui. 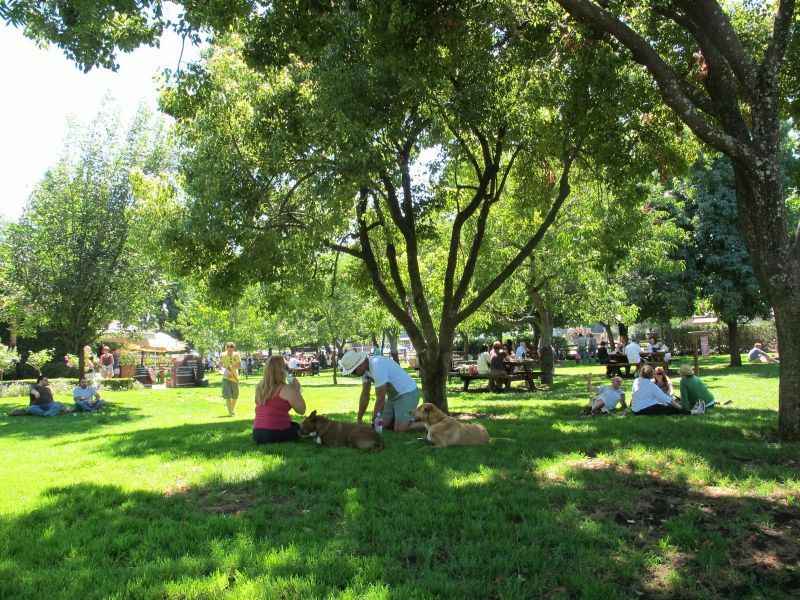 Many people equate coming to Napa Valley with eating in the lovely shaded picnic area there. 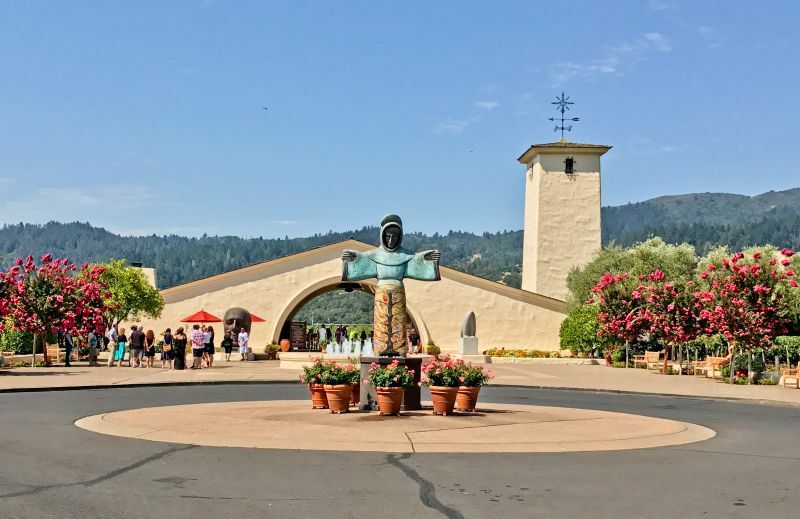 We were met by our very enthusiastic wine hostess and given a bit of a history and a tour of the grounds, the vineyards, and then down to a special barrel room for a seated tasting experience. 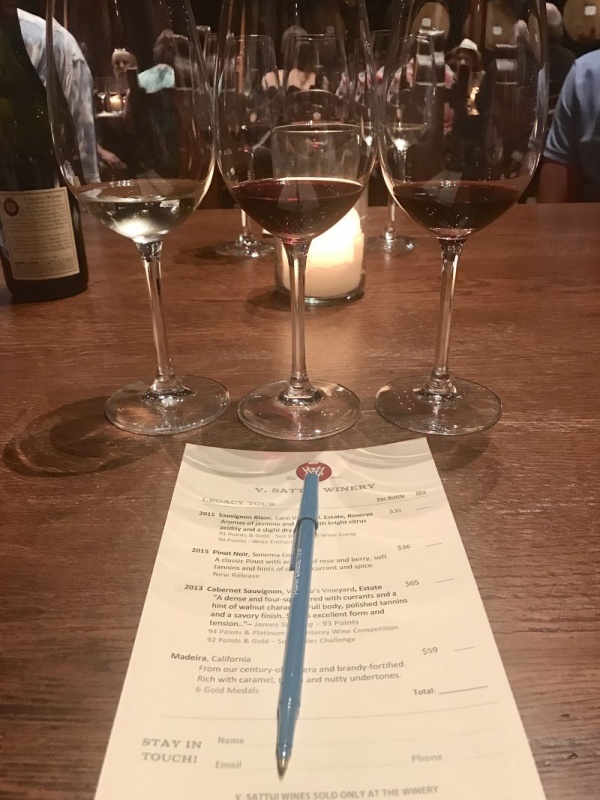 The thing that I liked about it was they provided tasting cards so that you could score the wines you were tasting and even make purchases from those choices. As we tasted, Dario Sattui’s niece came in to talk about the wines and to give a bit of personal family touch to the experience. We finished our tasting with a glass of their Madeira wine, which is what made this winery famous. Back on the train, the tour wasn’t quite over as we still had dessert to come. Oh, what a dessert! Pears poached in spices, a slice of almond cake, vanilla ice cream, and almond cookies all served in a pool of berry sauce. It was a perfect finish to our meal without being overly sweet. Yummy. Our six-hour tour had finally come to an end. I am trying to figure out which tour I’d love to do next. They all sound amazing. Hmm, maybe I can talk The Brit into taking me for our anniversary? I think the Murder Mystery dinner excursion would be a hoot too. 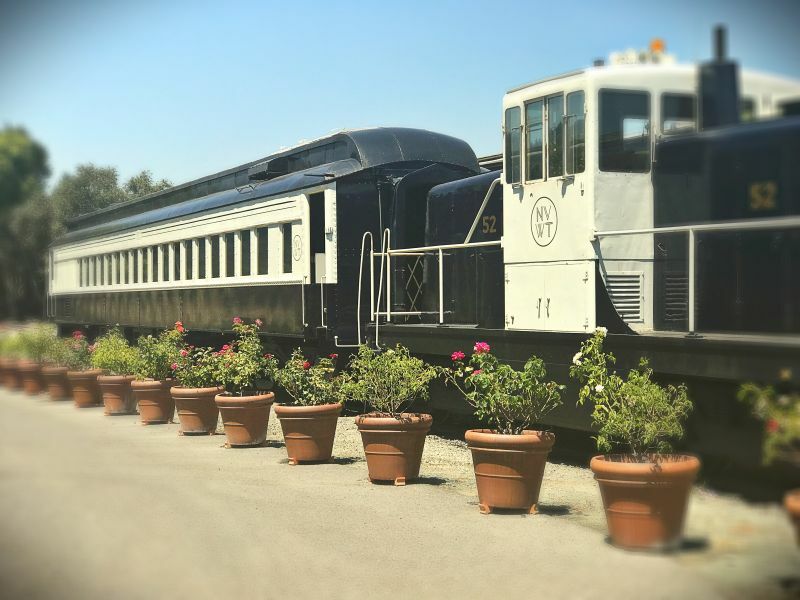 The #WineTrain loves our locals and we want YOU to experience all the fun of a ride through #NapaValley! Come on board for a gourmet lunch, Monday – Thursday, or dinner on Friday or Sunday, and receive 50% off! Use promo code: Local NSC. Restrictions Apply. What a fantastic article!! Thank you for this wonderful piece of information! I am ready to book!